Outdoor basketball courts are part of the plan for the sports and education complex. For decades the city’s Logan section has been known for one thing: sinking houses, a slow-motion disaster that cost millions of dollars and forced hundreds of families to abandon their homes. Now the neighborhood may become notable for something else: basketball. 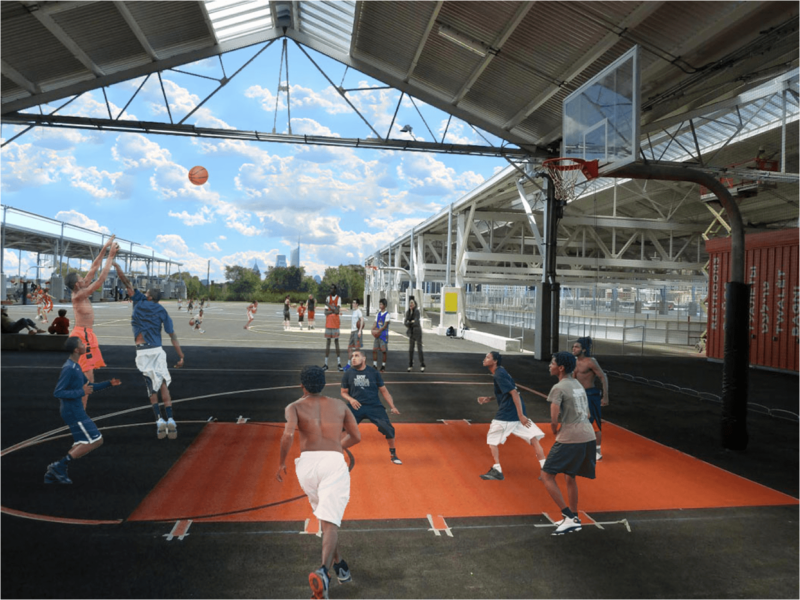 On Thursday, officials will announce that a new nonprofit group, Philadelphia Youth Basketball (PYB), hopes to raise $25 million to build a sports and education complex on part of a forsaken piece of property known as the Logan Triangle. The program uses basketball as a means to help young people, particularly those from poor communities, develop as athletes, students, and citizens. An 80-student pilot program currently operates at four Philadelphia public schools. The plan represents a serious effort to reclaim one of the city’s largest and most troubled vacant lots, though big challenges lie ahead, including fund-raising. The Goldenberg Group, chosen in September to develop the site, will work with the Philadelphia Redevelopment Authority to build the center as part of a project. The 120,000-square-foot facility is to encompass eight indoor and six outdoor courts, classrooms, a library, a computer lab, a pediatric center, a health and wellness office, and a Philadelphia basketball hall of fame. PYB leaders say they expect the center to attract youths from across the region, while directly benefiting troubled Logan. Mentorship will be key. 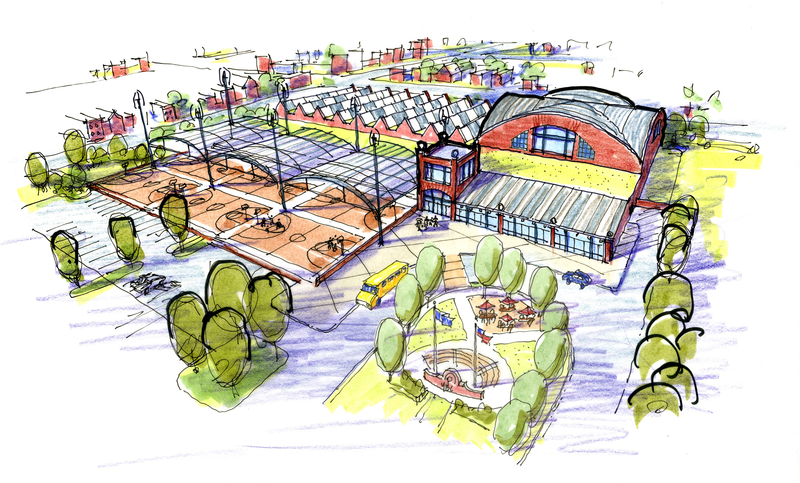 “We want young people in this program to reach their fullest potential as students, as athletes, and as positive leaders in their schools and their communities,” said PYB president and CEO Kenny Holdsman, former head of Legacy Youth Tennis and Education. Basketball, he said, is special in Philadelphia, offering a tool for change because it transcends race, ethnicity, and economics. Aimed at children and youths ages 4 to 21, the program will offer academic and college-preparatory help. Holdsman set a high bar to judge the nonprofit’s success: All participants will graduate from high school and obtain a level of higher education that enables them to earn a living wage. Sixty-five percent of Philadelphia high school students currently graduate within four years. The formal PYB announcement is scheduled for noon at Cooke Elementary School in Logan, at a news conference to be attended by coaches and players including Olympic gold medalist Dawn Staley and former NBA player Aaron McKie, and by political leaders such as Mayor-elect Jim Kenney. “PYB has the potential to engage and support children on a scale that Philadelphia has never seen before,” Kenney said in a statement. The nonprofit hopes to break ground in two years, which means it must quickly raise millions of dollars. City, state, and federal funding will be sought, along with donations from corporations and foundations. Plainly, $25 million is big money. Holdsman says he is confident it will come, because of both the merit of the project and the wide civic connections possessed by the nonprofit’s founders and leaders. The PYB board chairman is John Langel, a partner at the Ballard Spahr law firm whose sports clients have included the 76ers’ Doug Collins, the Eagles’ Ron Jaworski, and soccer star Mia Hamm. Board member Keith Leaphart is chairman of the board of the Lenfest Foundation. PYB founders include Steven Rosenberg, chief marketing officer at the Jewish Federation of Greater Philadelphia and general manager of the Jewish Exponent. In five months, with no official launch and little publicity, PYB has raised $600,000, Holdsman said. The group plans to simultaneously begin a social-media campaign, “I Am Philadelphia Basketball,” asking city residents to post short videos explaining the game’s importance to them. It uses the hashtag #IAMPYB and the Twitter handle @PhillyYouthBB. The Logan neighborhood sits in the heart of North Philadelphia, and is afflicted by big-city ills: crime, poverty, unemployment. It was considered an outskirts until the 1920s, when subway lines and street cars arrived and the first houses were built on what would become the Triangle. The ground was a 60-foot layer of coal ash and cinder, piled atop the buried Wingohocking Creek. In the 1950s, people noticed that houses were beginning to sink. By the 1980s, rowhouses and porches listed and leaned. On Feb. 14, 1986 – Valentine’s Day – a ruptured gas main exploded, wrecking two homes and damaging two others. Authorities declared 23 homes in imminent danger of collapse. A study found 957 houses in a 35-acre parcel were sinking, as the ash-and-cinder fill eroded. Most residents were urged to leave their homes permanently – setting off a painful 10-year exodus. Ultimately the city spent $38 million in mostly federal money to buy and demolish houses, and to pay for relocation costs and environmental remediation. The land became a weedy, empty expanse on which trash and speculation was heaped. The Triangle – named for the shape of the site – covers about 17 square blocks, bounded by Loudon Street to the north, a small part of Wingohocking Street in the south, Roosevelt Boulevard on the southeast, Marshall Street on the east, and 11th Street on the west. Over the years, proposals for the land included a supermarket, senior housing project, shopping mall, and tree farm, all complicated by one soft fact: The ash remains. “That’s hard to build on,” said the PRA’s executive director, Brian Abernathy. The PRA owns the land, and the Goldenberg Group holds the negotiating rights to its development. The difficulty in building there is a main reason the PRA chose Goldenberg – experienced, ready for a challenge, and familiar with how government operates, Abernathy said. Jeremy Fogel, the firm’s executive vice president and director of development, said the ash problem can be overcome. Remedies vary, but one involves driving structural piles through the earth until they hit bedrock, supporting the structure on the ground the way a pier supports a deck over the ocean. The company has handled similar obstacles elsewhere, he said, including a $140 million shopping center now being built on an old iron mine in Lehigh County. Creating an underpinning raises costs, he said, the extent of the increase depending on the size and weight of the structure and the nature of the soil. “We don’t for a minute consider this an easy site,” Holdsman said. But it has advantages, he added. It offers ready public-transit access and ties PYB to a larger revitalization effort. In surveys, Logan residents identified youth activities and mentorship as priorities.